The brain is composed of billions of interconnected brain cells, or neurons, that are responsible for processing incoming information and producing specific behaviors. With such a large number of cells and an even larger number of connections, uncovering the specific connections that perform a given function is a challenging task. While understanding the inner workings of the brain is a motivation for many neuroscientists by itself, damage to specific areas involved in processing of sensory information, for example from the eyes and ears, can lead to numerous different cognitive impairments (“agnosias”) and even certain forms of blindness or deafness. A more complete understanding of these pathways can therefore be useful in developing therapies or medical devices to correct such deficits. Additionally, the brain is modular in design (the same components can be used in multiple functions), so understanding of one sensory processing system is often beneficial in understanding similar pathways in other systems. The system that processes visual information from the eyes has been studied extensively over the past sixty years. 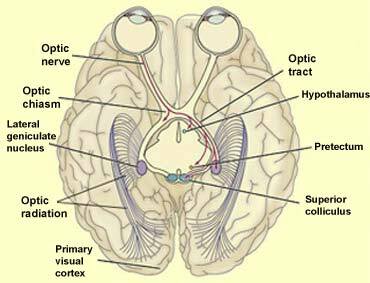 It is believed that there is a central region in the brain, known as primary visual cortex, that receives incoming visual information and sends it out to several other areas that process specific features like object orientation, color, and motion. These features are used to recognize objects, and are eventually integrated in learning, memory, and decision making. Non-mammals, like birds or fish, have a different region, the tectum, that receives visual information. Though a similar structure is present in mammals, the superior colliculus, scientists believe it plays a much smaller role (e.g. controlling head and eye movements). However, a new study from UCSF challenges this belief, suggesting that there may be areas of the mouse brain that do not get their information through the typical pathway from primary visual cortex, but instead follow a pathway more similar to those in birds or fish where information is delivered from the superior colliculus. The authors focused on one area of the mouse brain called the postrhinal cortex, which is known to respond to objects in the visual field, but for which the pathway transmitting information from the retina was previously unknown. The study uses optogenetics, a technique which allows specific cells in the brain to be activated or silenced using colored light. Here, blue light is used to suppress the output from a given region of the brain. Essentially, a pathway in the brain can be viewed as a series of connections, passing information from one region to the next in a sequence. Blocking different areas in this sequence acts to “cut” these connections, and so the outcome at the end of the pathway, here in the form of electrical signals, should be altered. However, blocking each of the steps in the common pathway passing through primary visual cortex to the postrhinal cortex failed to change the final response, suggesting that information had to be coming from somewhere else. Turning to the structure that controls visual information in non-mammals, the superior colliculus, and repeating the procedure dramatically reduced the recorded responses, suggesting that, for the first time, a visual processing center is largely independent of the conventional information processing pathway in mammals and instead relies on a different sequence of connections. A final test studied the responses of the postrhinal cortex to visual patterns and found that these neurons excel at recognizing moving objects. The presence of a visual center independent of the typical pathway is interesting by itself, but also suggests that more non-conventional processing pathways may exist in centers for vision and other senses. This also offers a possible explanation for the phenomenon of “blindsight” in primates, a partial recovery in detecting objects after damage to the primary visual area, though the presence of this unique pathway in primates has not yet been confirmed. From a broader standpoint, this conclusion highlights an important point- even in well-studied systems, like the visual pathway, there are always new discoveries waiting to be made.